Model organism databases are great. They span a spectrum of model organisms as diverse as mouse, rat, fly, worm, zebrafish, yeast, and E. coli. And they fulfill key roles for their respective communities, from warehousing key genomic data, to providing query and visualization tools, to performing biocuration. The NIH (and other funding agencies) pay good money to fund these community resources, and they are well worth their expense. Crowdsourcing is one of our hammers, so we start seeing nails. But what happens when your favorite organism isn’t covered by one of these existing databases? 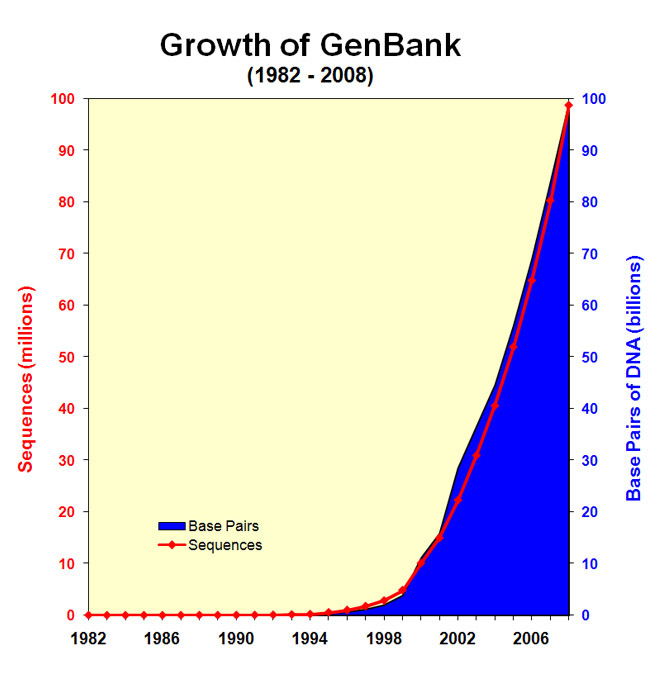 The number of sequenced genomes is increasing rapidly1, via both targeted sequencing of organisms of interest as well as metagenomic sequencing of complex samples. It seems impractical to fund a model organism database for each of them. The Generic Model Organism Database (GMOD) project offers open source software for this task, but creating a GMOD instance still requires a significant and ongoing investment in bioinformatics. Now, this phenomenon is undoubtedly replicated across a diverse array of organisms and annotation efforts. Organizing and structuring these data would be incredibly valuable, both for researchers who study each individual organism, as well as in aggregate for bioinformatics analyses that span multiple organisms. How can we begin to address and solve this problem? Create data importers for structured data from NCBI, Ensembl, and other genomic databases. Create an alternate back-end for both JBrowse and WebApollo that is based on Freebase, resulting in CMOD-backed interfaces for genome browsing and editing. Create a community submission interface for Gene Ontology annotations. I think this is a great idea! At present genome annotations are spread around the internets in disparate formats. For example, Rfam annotations are fairly invisible where they are. In theory DAS was meant to solve some of the sharing annotation issues. But I don’t think it has. This does seems like the sort of thing that could be in ENSEMBL’s scope, yet isn’t there yet. I completely agree with the need for this. As more sequences come along–many of them for user communities that just don’t have that kind of support–this could be a huge benefit. Recently I did a workshop and one of the attendees was a woman who worked outside of the academic arena. She had a bunch of really interesting marine organisms that she was getting sequence for. But she had really no support downstream of the sequences for annotations and visualizations and such. It would be a shame if these things weren’t available for more people to see and explore. Might avoid the name ‘model’ though. I think that’s part of the thing we want to get away from. Andy, One of the most problematic instances of results that get burried are papers about genome improvements. So the field of proteogenomics publishes improvements in genome annotations (new genes, etc), but this data is nearly always burried in supplementary data and never gets integrated. The second example of this is functional characterizations that trickle in one by one. See any issue of JBC and someone is biochemically characterizing an operon of hypothetical proteins. I’m not sure that these results ever get fully integrated. WikiData and FreeBase are interesting ideas for hosting, but both present challenges. The CMOD infrastructure should be abstracted away from any particular storage infrastructure. Both WikiData and FreeBase have triple-like models (with slight differences to the W3C RDF model, e.g. no bNodes). In fact GMOD-CHADO uses a triple-like model of sorts. A lot of the work in mapping a genome annotation model into triples has been done for you – see https://github.com/JervenBolleman/FALDO (which doesn’t use bNodes and would easily translate to a FreeBase information model). If the infrastructure for CMOD uses a bNode-free subset of RDF then it should be transferrable to different hosting solutions, including any kind of triplestore in the cloud, which I think would be a good thing. @Sam Payne, exactly! You’ve hit on both the use cases that ended up in the grant proposal — genome annotations (e.g., gene boundaries) and functional gene annotations (e.g., Gene Ontology annotations). @Chris, as usual, you’re touching on an important data modeling issue, and it’s a key issue in terms of how CMOD will interact with the rest of the universe of bioSemWeb resources. Thanks for the thoughts!